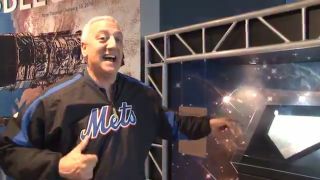 Former NASA astronaut Mike Massimino cheers on the Mets for Game 1 of the 2015 World Series at the Intrepid Sea, Air & Space Museum in New York City, where a Mets home plate that he took into space is on display. NEW YORK — Attention, sports fans! Game 1 of the 2015 World Series between the New York Mets and the Kansas City Royals launches tonight (Oct. 27), and not even astronauts are immune to baseball fever. Case in point: Former NASA astronaut (and proud New Yorker) Mike Massimino, who recorded an awesome video to root, root, root for his home team. Massimino loves the Mets so much that he took Shea Stadium's home plate into space in 2009 during his last space shuttle mission. (That space-flown home plate is on display at the Intrepid Sea, Air & Space Museum here in Manhattan.) Massimino is the senior advisor for space programs at the Intrepid. A native of Franklin Square, New York, he flew on two space shuttle missions — both of them to upgrade the Hubble Space Telescope — during his NASA career, and left the space agency last year to take a position at Columbia University.